If you want to do your own BJD face-ups but are afraid of paint, you can create a beautiful face-up using dry colors. 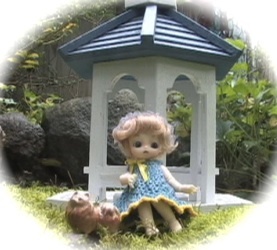 The video covers stripping an old face-up, preparation, and coloring the head. Mint on Card has announced that they will be the exclusive dealer for doll heads from a new company, MP Dollhouse. The company has one head so far that will be available for sale soon. The head, named Chitsuki, will have interchangeable ears. The basic head will come with human ears, and there will be elf and mermaid ears available separately. Chitsuki’s resin colors will match Volks normal or white skin. The head is for an SD (60 cm) body. 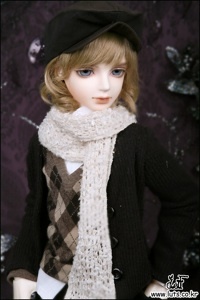 Elysium Doll has just posted a Gray-N doll head as available for order. The head comes in normal skin and is designed to fit a Volks SD 13 sized body. K-Doll has posted an announcement regarding shipping of newly ordered doll heads. Due to an unexpectedly high number of orders, the heads will be sent out as they are made. Previously, the heads were all made, packaged, and mailed at the same time. There is no way to tell the likely delivery date, but all ordered heads will definitely be shipped. The last order placement period was for overseas customers to finally purchase the original model Kill-u head before it was completely retired.